SAN DIEGO - Sailors assigned to aircraft carrier USS Carl Vinson (CVN 70) returned to Naval Station North Island in San Diego after completing three days of sea trials, April 30. The at-sea period allowed Team Vinson to assess the ship's state of readiness and ensure maintenance was properly accomplished. The crew, at sea for the first time since June 2015, tested equipment that supports surface operations, flight deck evolutions, deck seamanship and damage control readiness through various drills and system checks -- ensuring both ship and Sailors are ready for future operations. "During this underway, the crew completed in-depth general quarters training that simulated about as close to actual conditions possible," said Capt. Eric Anduze, Carl Vinson executive officer. "Executing our training evolutions while in an at-sea environment allows us to identify and address any challenges we may be facing." 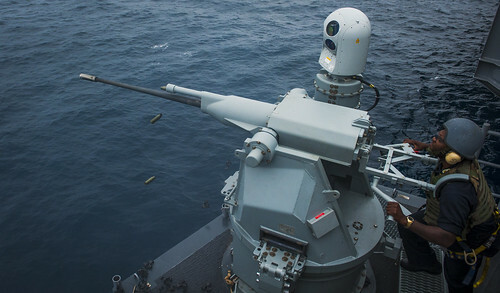 Other important highlights of this underway period included man overboard drills, active shooter drills, high-speed turns to test ship maneuvering capabilities, and testing of the ship's countermeasure wash-down system on the flight deck, the fixed Aqueous Film Forming Foam (AFFF) sprinkler system in the hangar bay, and the ship's newest self-defense weapon, the MK-38 25mm chain gun system. "These training evolutions are meant to prepare Sailors so they can perform their duties in real-life scenarios," said Anduze. "It's one thing to train our Sailors in a classroom environment. It's another thing entirely to incorporate the hands-on experience." Command Master Chief Marty Barnholtz said the crew trains to win and he believes they will overcome any new challenges with ease. "I think we have the best of the best -- the finest crew out there," said Barnholtz. "I say that because our Sailors take an extreme amount of pride and professionalism and put it into their jobs. They are dedicated to the Navy. Everything we ask this crew to do, they've done it with their heads held high. They love what they do and they give their all, 100 percent of the time." Barnholtz explained while the crew has worked hard to get the ship to its current level of readiness, there is still a lot of work ahead. "We came out on sea trials, we were successful and now we get to go home, button up a few things and get back underway," said Barnholtz. "We will continue to train; we will strive to be better. We have an entire summer of underway periods and certifications still to come and I'm sure that Team Vinson will shine as they always do." Carl Vinson's next milestone will be flight deck certification, which will prepare the ship and embarked crew to maintain readiness to answer our nation's call to serve.